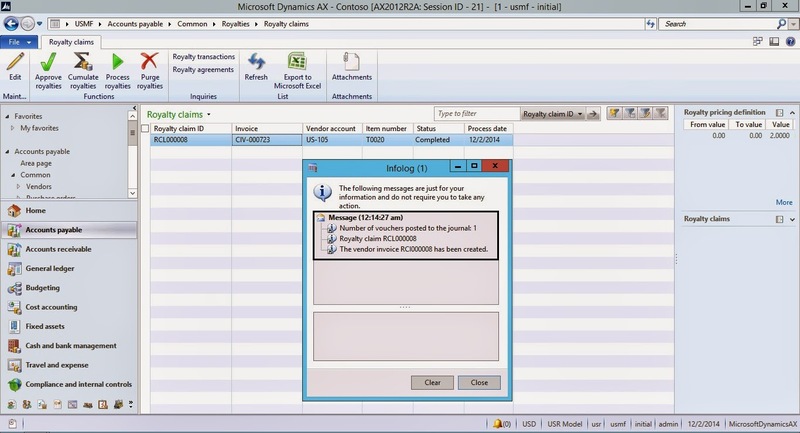 I'm going to explain the Dynamics AX 2012 R3 Royalty Management that how to set up a Royalty Agreement that specifies the royalty that a person will receives against the sale of item for it's goodwill. Let’s have a look that what is meant by term Royalty? A Royalty is a fee that one party (the licensee) pays to another party (the licensor) for the use of intellectual property, including logos or copyrights. Normally, the original owner of a product sells their product against a certain share of future revenues. In the Accrual journal name field, select the journal to which to post royalty accrual amounts when the royalty is approved. In the Accrual account field, select the account to which to post interim royalty liabilities that will be the liability account in which the royalty liabilities would be credited. In the Expense account field, select the account to which to post interim royalty expenses that will be the charge account where the royalties would be charged. Procurement category is used for vendor invoice creation to pay the royalty liabilities. Note: If you calculate royalties on a weekly basis, in the Royalties field group, in the Starting day of week field, select the day of the week on which to calculate royalties. Once the parameter setups is done now we can create Royalties agreement. To setup royalties agreement use the following procedure. 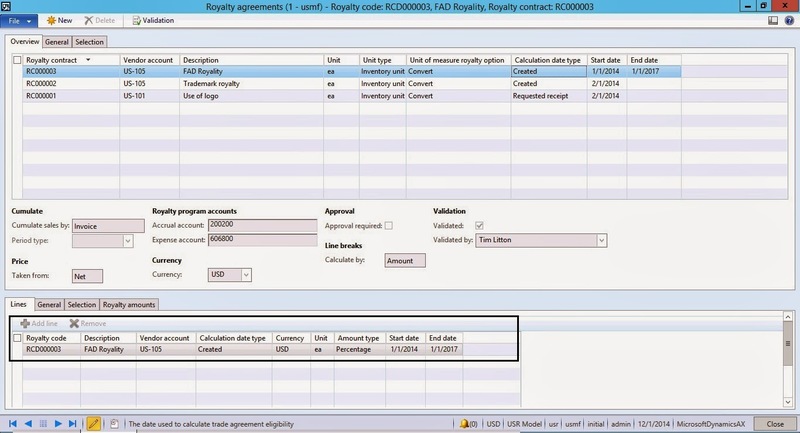 In the Royalties Agreement form click New to create new Royalties Agreement in the upper pane. In the Royalty contract field enter the identifier for the royalty agreement. 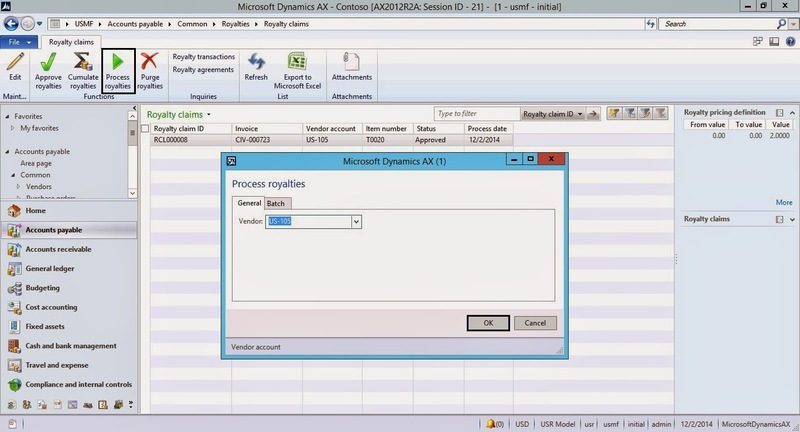 Select the vendor account number for the Royalty contract in the Vendor Account field. Enter the description of the Royalty agreement. Select the unit of measure for the royalty quantity. 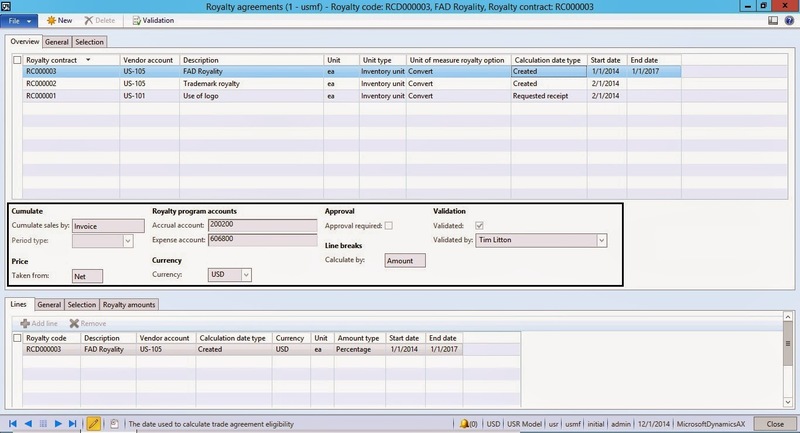 Select or view the royalty agreement unit type. The values are Inventory unit and Catch weight unit. 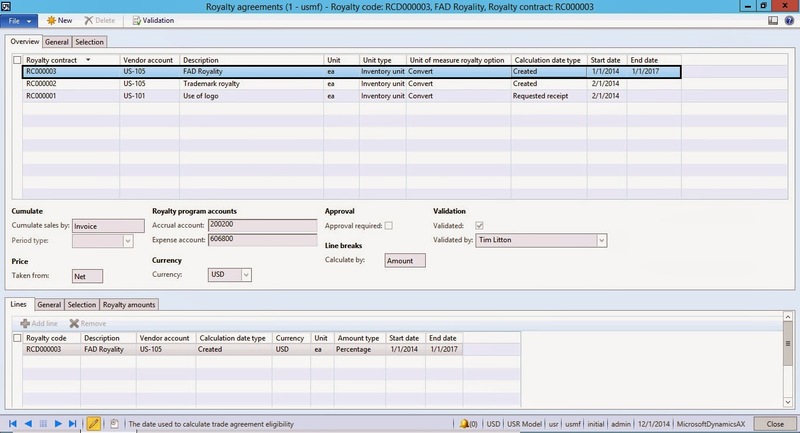 Select the unit of measure royalty option for the royalty agreement. This option identifies the unit of measure for the royalty line. If you use the Exact match option, the unit of measure for the royalty line must exactly match the unit of measure specified in the sales order. If not, the royalty does not qualify. If you use the Convert option, the unit of measure for the royalty line is the same as the unit of measure for the royalty agreement. The royalty unit of measure is converted to the sales order unit of measure, or the catch weight unit of measure, based on the option selected in the Unit type field. 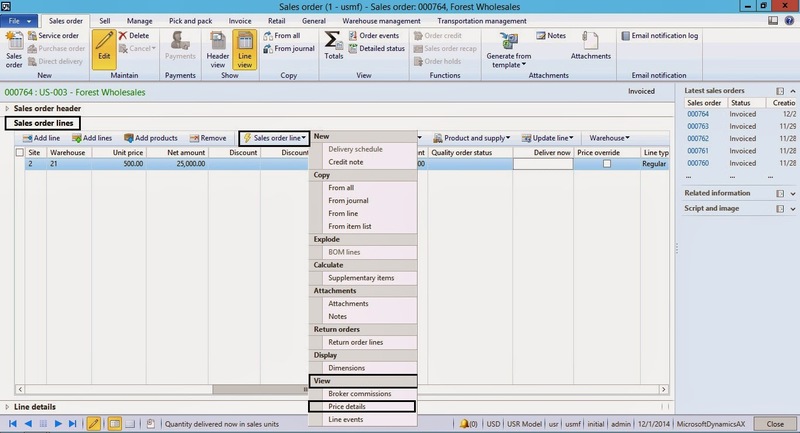 Select the calculation date type as Created, Requested receipt date, Requested ship date according to the need. Enter the end date on which royalty will no longer be created based on this agreement. If the agreement does not end, leave the field blank. In the Cumulate sales by field, select whether to cumulate royalties by invoice or by a time period, such as weekly or monthly. In the Taken from field, select whether the royalty value is taken from the net price, or gross price of the item. In the Accrual account and Expense account fields, select the accounts used for interim liability postings and interim expense postings, respectively. Verify that the correct currency is selected and then, if a royalty must be approved before accrual or payment, select the Approval required check box. 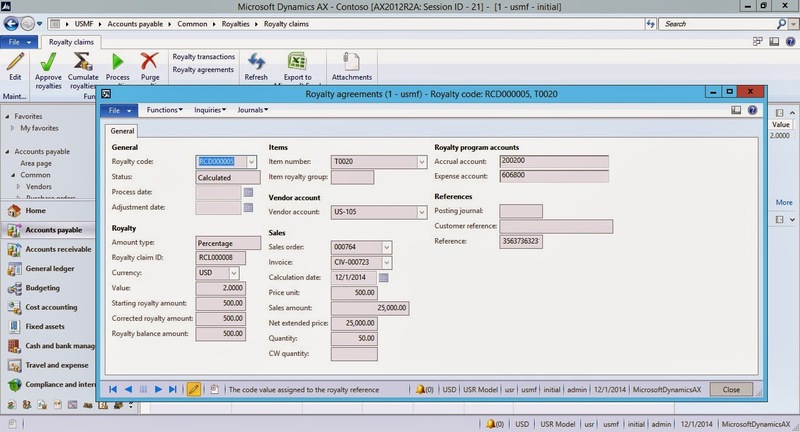 In the Calculate by field, select whether the royalty break is based on the item quantity on the line item or the amount of the line item. select the Currency code which determines the currency in which royalty is remitted. You can specify a generic currency, which is converted on the order, or you can specify a specific currency for the royalty. 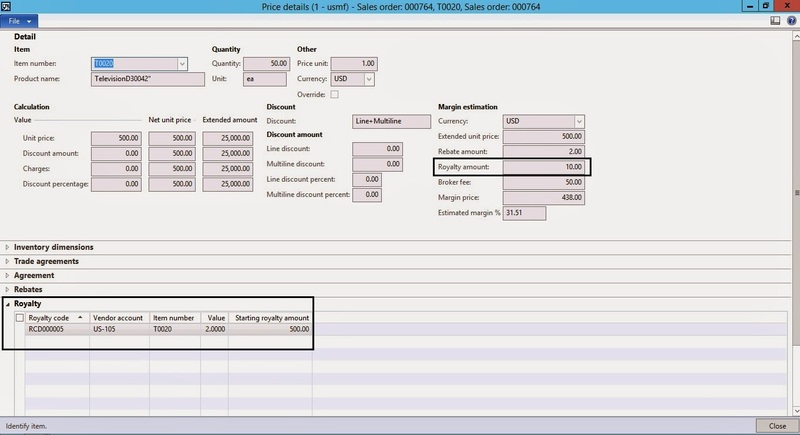 select the amount type as Amount per unit of amount per sold unit, Fixed amount or Percentage of the net amount sold. 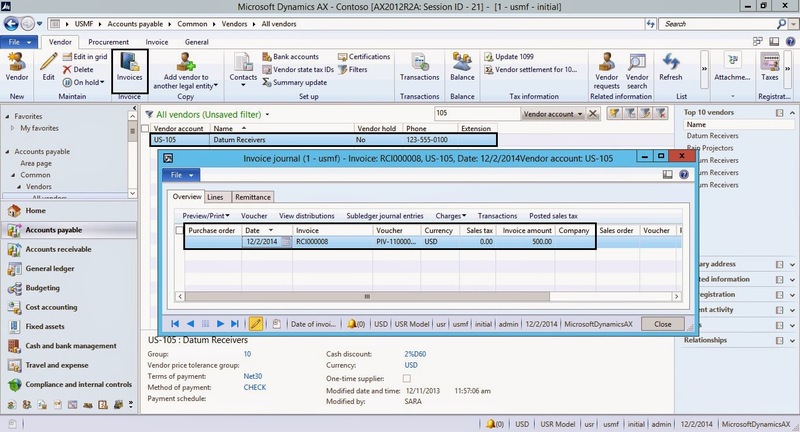 Select the product dimension i.e. Size, Color, Configuration etc. Select the item storage dimensions i.e. Site, Warehouse, Location etc. Enter the value of the royalty. 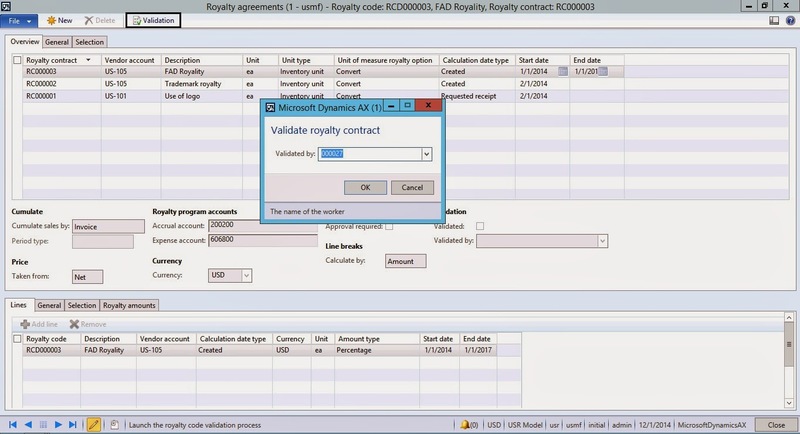 Validate the Contract by clicking on Validate button on the upper pane of the royalty contract. Now once the agreement is validated in the Royalty agreement form, we can use the royalty agreement as per the terms in the agreement on the sales order line. 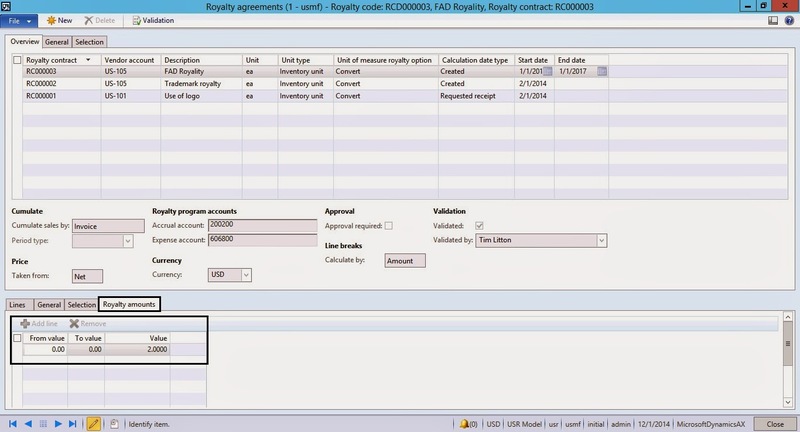 To view the royalty amount generated for the sales order transactions, create a sales order for the item and the customer as specified in the royalty agreement. 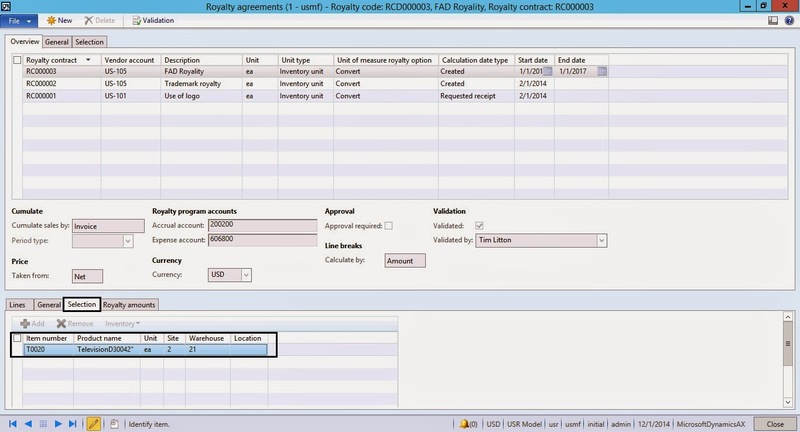 After the sales order is invoiced, we can see the royalty claims created by the systems according to the agreement. Note: As you can see the status of the royalty claim is 'Calculated'. It will be only done, if the 'Approval' check box is selected on royalty agreement in middle pane of the agreement. If this is cleared then systems will auto post the Royalty claims to the ledger accounts defined in the agreement and the Status of the Claim will be auto set to the 'Completed'. Click on Approve button on the action pane of the Claim grid. Once the royalties are approved, click on 'Process' button to process the Royalty claim for payments. Click on 'Ok' button to process the royalty claim. Now an invoice for the Royalty claim has been created for the vendor. We can process the vendor settlements through the 'Payment Journal' against this invoice in accounts payable module for royalty Claim payments. Excellent piece of explanation. Need one like this on LC charges.